Blurb: What if the characters in a vampire novel left their world--and came into yours? 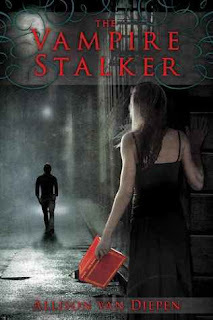 Our review: The Vampire Stalker was a fun read. Two of us read this out loud and we both enjoyed how it played out like a movie, full of dialogue and action. The premise of the storyline was unique, giving this vampire story an appeal all of its own. There are a handful of titles we could blurt out right now featuring characters we'd love to run into in real life. As for the explanation of literary physics, we thought this explanation was creative though a tad bit under-explained. We would have liked to have seen the librarian, Ms. P. utilized more throughout the story. As for the conflict, though it was predictable--I mean, how else can a battle between good and bad end, right?--getting to the inevitable resolution had some nice and unexpected turns. We also raised an eyebrow when two detectives listened to Amy, a sixteen year old girl, during their investigation. We suspended all belief and kept reading. Part of the ending was simple to figure out, but just when we thought we knew everything, Allison Van Diepen threw us a slight curveball which we wound up loving. The Vampire Stalker was a complete package: entertaining, well paced, had a boatload of engaging characters from present day Chicago to the one in another dimension called Otherworld, had an realistic and involved parental figure, and enough action to keep us immersed. We were so glad to see Amy and Alexander visit the author of the Otherworld books and especially liked how Amy wrote fan fiction. There were a few instances when the dialogue between Amy and her girlfriends sounded slightly corny, and we would definitely recommend this to tweens and younger YA readers but not to older and more sophisticated book lovers. We don't know if the author will revisit some or all of these characters, but from the ending there is that possibility and we would grab it in a heartbeat. The Vampire Stalker is a quick, engaging and fun read. Favorite excerpt: "In the stillness of my bedroom, something had changed. I wasn't alone. The gray mist of dawn lightened the window shades. My eyes swam into focus. Alexander was there, sitting on the edge of my bed. His shirt was blood-spattered, his hair messed up. Last night came rushing back to me: Vigo. The police. Alexander knocking me out of the way. How I'd blacked out for a minute after falling to the ground, and then opened my eyes to see Alexander being restrained by the poice . . . and Vigo gone. Luisa and Katie had helped me up and rushed me out, frantic. Luisa called her parents so they could pick us up and take me straight home. I'd been in a daze, barely able to make sense of anything. "I'm sorry to have awakened you," Alexander whispered. "I just wanted to make sure you were all right." "I'm fine," I said, sitting up. I'd never been so happy to see someone. "Did you break out of jail?" "There was no need. Once you left, I broke free of the police and went after Vigo. But he was long gone."" Cover comment: We like the dark of the night and the shot of both Amy and Alexander's backs. Gives the cover an air of mystery. I'm super excited to read this one, I have it in my TBR shelf. Glad you liked it! Though I guess in the battle of good vs. evil it's pretty obvious who'll win. Though you found it entertaining in the meanwhile so I think I'll like it. Oooh this book sounds really good! :) I'll have to read it. Great review! This sounds like a good read, I mean what girl wouldn't want her favorite fictional character to come to life.